This holiday home is the ground floor of a large villa with a beautiful view over the lake. The spacious garden is private, the children can play here. There is also a ping pong table. On the spacious terrace you can enjoy breakfast (5 minutes drive to the bakery) and also in the evening you can enjoy the sunset during the barbecue. The pool is 25 metres from your front door and you have all the privacy at the pool (no view from the house). You walk via a nice path to the lake (300 m), where you can swim or fish. It is a beautiful, authentic home both inside and out where you really experience the feeling of Burgundian life. The location is also very nice and quiet, amongst the green hills. An extra attraction is the immediate proximity of the famous Lac de Pannecière, which can be seen from the house. Here you can swim and fish. Beyond the lake there is even more natural beauty on offer in the Morvan, as well as history, for example Château-Chinon. And if you are in Burgundy, then you can't miss trying some wine. For drinking next to the pool, for example. Please note: the owner lives on the top floor, you have complete privacy, the garden and the entrance to the upper house are on the other side. 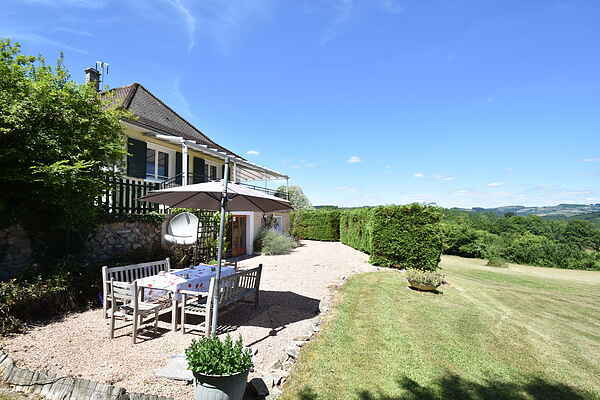 amongst hills, valleys, lakes and woodlands in the beautiful Natural Park of Morvan in Burgundy, France? and a perfect starting position for visiting places, such as, Dijon - the capital of Burgundy, the Roman city of Autun and the world heritage site of Vézelay to name a few. Lac de Pannecière and Lac des Settons. besides places to taste the delicious Burgundian wines.